“There’s just so much beneath the streets of New York City that people walking around on the surface don’t ever think about,” journalist Will Hunt says. His new book is Underground. Hunt started out by exploring the city’s sewers and subway tunnels, where he dodged trains and met a community of people who knew a version of the New York that was invisible to everyone else. Eventually, Hunt’s curiosity took him to hidden places around the world, including the catacombs of Paris, underground cities in Turkey and the inner recesses of caves where ancient societies practiced religious rituals. His new book is called Underground. You register it at first as this subsonic rumble at your feet, and then you hear — or rather you feel — wind and suddenly there’s this blast of of light coming behind you. What you have to do is jump up on the catwalk and run down the catwalk and find an emergency alcove where you can hide yourself while the train rushes past. Most people don’t really have the experience of being near a train when it’s moving at full speed. A train slows down to a platform usually so when you’re in the tracks and you’re kind of crouched in an emergency exit alcove the train is hurdling through the dark so you’re getting this really intense sound and wind and this kind of rush of metal. Your heart is pounding. It’s very intense. One of the things that I fell in love with right off the bat was this graffiti writer called Revs, who during the 1990s spent six years writing his autobiography on the walls of subway tunnels, which is to say between platforms in the sort of dark spaces that are hard to reach and covered in soot. It’s like the no man’s land. And he would go down and put up a five by seven foot rectangle of white or yellow paint and then write a little vignette from his childhood on the panel, and he would number them within a series and then sign it. And there are 235 of these panels scattered throughout New York City. When I was first starting to go down the tunnels I would come across these these pages and I just thought it was such a beautiful and mysterious art project. Today there are not so many, but there was one night where I went down to that tunnel with a group of urban explorers, and we celebrated the 50th birthday party of a woman named Brooklyn who had been living in that tunnel for 28 years, she said. We went down with whiskey and cake and we sort of sat around on the stairs outside of her home down there. … In the eaves of the tunnel kind of in this alcove that was accessible by an iron staircase. She called it her igloo. There was a mattress and some sort of bent pieces of furniture. She was a really amazing woman, very charismatic and dynamic. That night she spent hours singing and dancing, and it was a really great party. It was sort of an extraordinary experience. At first, the sewer felt kind of repulsive in the way you would imagine. It’s got this funk to it. There are these long, stringy strands of bacteria down there that urban explorers called snotsicles. So I’m kind of repulsed at first, but Steve [Hunt’s guide to New York City’s tunnels] tells me that there’s a stream flowing through the the wastewater in this tunnel. We’re walking up and down this this sewer pipe and there’s something really beautiful about knowing New York City as this big growling metropolis. Is this like big tough place. And then to be under the streets feeling this ancient stream flowing around your boots, the city felt very vulnerable. It was like I was making eye contact with the city. It was kind of a beautiful moment. A lot of people are familiar with the the tourist track in the catacombs where you can walk down a tunnel lined with skulls and bones. So that runs about a mile, and beyond that there are 200 [more miles] of catacombs. … It’s just this wild, earthy honeycomb of stone tunnels that were originally dug as quarries. So all of the the elegant buildings along the Seine are made from blocks of limestone that were dug out from beneath the city. 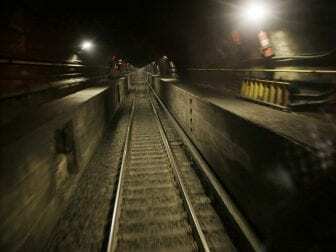 So the earliest tunnels there were dug, I believe, by the Romans who were in the city when it was known as Lutèce, and every subsequent people to populate the city of Paris has dug out this system wider and deeper. Today it’s just this completely magical labyrinth down there.